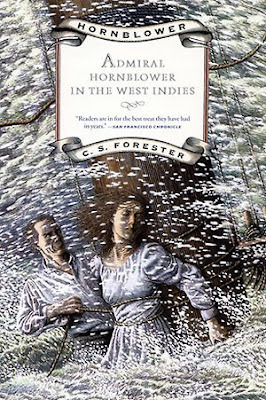 Admiral Hornblower in the West Indies (1958), also known as Hornblower in the West Indies, is C. S. Forester’s eleventh and final Hornblower novel by chronology, ninth by publication. It is made up of five mostly unrelated shorter stories, and reads much like Mr. Midshipman Hornblower (1950). The title is more or less the plot summary, as Horatio Hornblower deals with various relatively minor crises during peace-time. This novel features some of Forester’s all-time worst storytelling. Both “St. Elizabeth of Hungary” and “The Hurricane” are irritatingly, excruciatingly predictable. It isn’t just that the reader will see the “twists” coming (which they certainly will), but that the reader will be rightfully annoyed with Forester for having resorted to such cheap plot devices and not putting in a decent effort. In fact, “St. Elizabeth of Hungary” is the worst Hornblower story ever written. Not only is it horrendously predictable, but never has Forester so egregiously thrown one of the ridiculously convenient coincidences that have helped Hornblower become so successful in the face of the reader. Hornblower here bemoans at length the sacrificing of his honor – never mind that he has acted dishonorably quite a few times before. Hornblower has repeatedly demonstrated (to the reader at least) that he is not a man of integrity, and the reader should not be sympathetic to his despair now that he has finally committed a dishonor that will become publicly known. Admiral Hornblower in the West Indies does have its moments, but it suffers not only from Forester’s lackluster storytelling but also from the fact that Forester still hasn’t figured out how to put a flag-rank Hornblower into situations that are both interesting and believable. From a high and lofty administrative position, Hornblower lacks both the interaction with other characters and the opportunities for split-second decision-making that make the best Hornblower stories so good. It isn’t that Forester ran out of ideas for Hornblower – Lieutenant Hornblower (1952) and Hornblower and the Atropos (1953) were published immediately before and Hornblower and the Hotspur (1962) immediately after this one, and they are the finest novels in the series. And so with Admiral Hornblower in the West Indies the Hornblower series mercifully fizzles out. Those who have read the series by chronology will note that on the whole, the first half was measurably more interesting than the second, and that the series had been losing steam for quite a while. The series as a whole is recommended, though, on the strength of Forester’s novels of Hornblower’s career pre-Beat to Quarters (1937).